We're back! The convention was amazing, and the quick trip I took to Disney World was awesome. 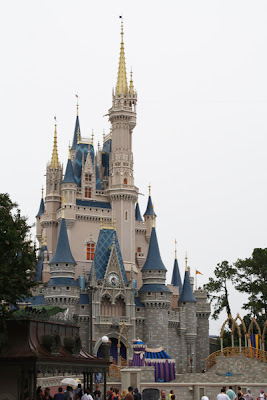 Joel opted out, preferring to enjoy the remains of the con and get some down time (totally understandable, my feet just about fell off after Disney World) but I thought I'd post a bit about the half-day of park fun and a little Downtown Disney shopping. So we (being myself, my boyfriend Sam, and our friends Claire and Jason) bought half-day tickets to Magic Kingdom. It was a deal they had going specifically through the convention, and I have no idea if this is something they do with cons often or what. It worked out well for us because it meant that we didn't miss much of the con (like an hour and a half maybe) and we had enough time (4-10 pm) to get through a lot of the stuff we wanted to do! We parked, hopped on a monorail, and were swept off to MK. Seeing the castle from the monorail is like my favorite thing ever. Seeing the castle from anywhere is like my favorite thing ever, actually, I took like 20 pictures of it without even noticing. After ogling Main Street and the castle and the sheer joy of it all we took some quick pictures and headed off to Adventureland. Mainly, I really wanted a Dole Whip and to see The Tiki Room properly restored to it's former enjoyable state. The combo of those two was awesome. We also did Pirates of the Caribbean, the wait time was probably the shortest I'd ever seen it. I should mention though that it was a Sunday and it was raining on and off, so pretty much everything had short wait times. We were getting hungry and Claire and I were craving corn dogs so we headed over to Casey's. I had actually never eaten there for whatever reason, which is strange, but the corn dog nuggets are awesome. Since it was conveniently connected we took a stroll through the Emporium. After that we went on Space Mountain. For whatever reason I've always had terrible luck with this ride. The first two Disney trips I've been on I was too little to ride it, then the next time I got in line only to feel pretty sick about halfway through the queue, and then the most recent MK trip I took it was closed for repairs. So I was super excited to ride it, and it proved itself to be worth the wait. From there we went on the tea cups which I have ridden in ages and I wish I'd gotten pictures of. 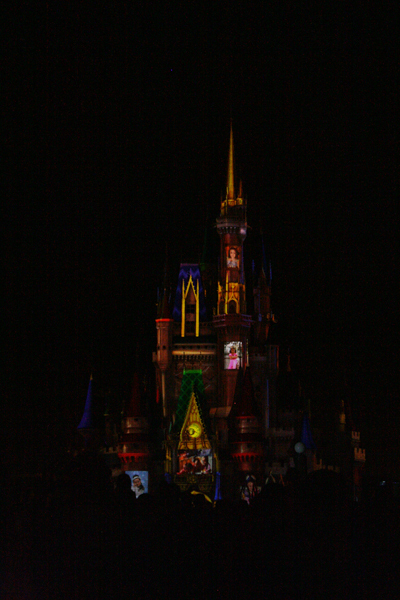 Then we went to watch Magic, the Memories, and You which I did get a couple of pictures of. It's really amazing to watch in person but pretty hard to take pictures of because everything moves quite a lot. We skipped the fireworks because Claire and I aren't big on loud noises. So we rode Small World instead. It's not a popular ride, I know, but I really love Mary Blair's backdrops, and a trip to the parks seems incomplete to me without riding it. After that was our last ride of the night, The Haunted Mansion, which had a really short line as well. We went through the interactive queue despite the rain because I hadn't seen it yet and was interested. I'd love to check it out more thoroughly sometime! 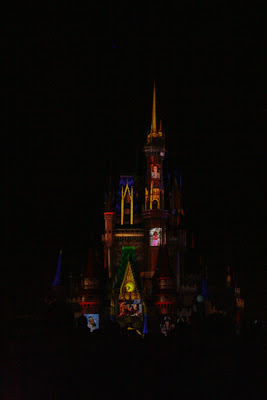 After that we had just enough time to get a Mickey ice cream bar and enjoy the lights of Main Street at night. It's always really bittersweet to leave the parks. I'm crossing my fingers for a full trip sometime in the next couple of years. I miss it already! Enough melancholy, time for swag! 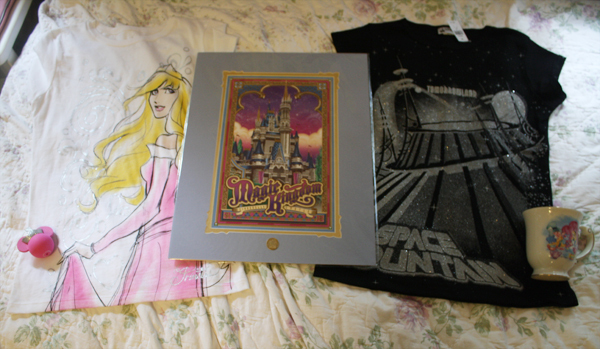 I got two t-shirts, the Aurora one is a girl's XL which is about the same size as the Space Mountain one (I finally rode it, I deserved a t-shirt) which is a women's medium, for fellow princess enthusiasts frustrated over the lack of stuff in women's sizes. I also got a princess themed mouse head antenna topper with a little crown, a beautiful Alice in Wonderland mug that I should probably take a better picture of at some point, and a really gorgeous print of Cinderella's castle. A nice little haul I think! 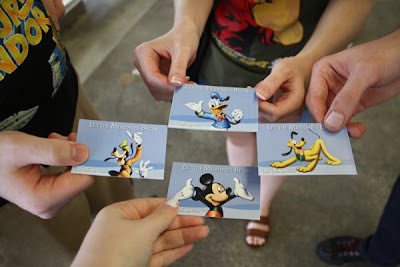 That's so cool that you got to go, I haven't been to MK in years and would love to go again in the near future. I totally know what you meen about the limited women sizes; I've had my share of pretty Disney Princess Tees that I couldn't get because they had none in my size and so I had to settle with a different shirt. Thanks for sharing! I hope you can go! I'd like to go back again for a full vacation sometime soon myself :D It's so frustrating! The only princesses they put on clothes for women are Snow White and Ariel, pretty much, and even then it's few and far between!